The Nik Meller Collection of elegant premium grade optic crystal Awards are designed by International furniture designer and sculptor Nik Meller. The Apollo has beautiful cuts and a red accent which make this award really pop. 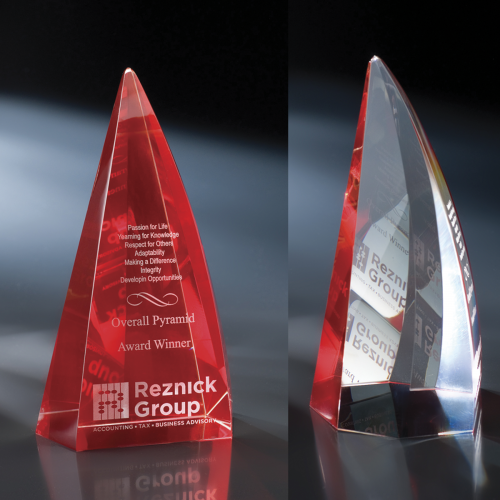 This award triangular award has a slight curve to it giving it a character of its own. Pure K9 premium optic crystal award. 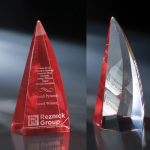 A flame shaped award is accented with a strip of red crystal. Available in two sizes. Pure K9 premium optic crystal award with a blue, green or red crystal ring with a little dip cut out. A clear crystal circle is attached to the back of the ring for engraving. A black crystal base used for the stand. Available in blue green or red. Only blue piece comes two sizes too. Pure K9 premium optic crystal book. Do you have an open book policy What is your mission statement These are just some of the popular usage for the open book.